Our Falling Snow Scarf is the fairest of Fair Isle projects, its sprinkle of storybook-perfect flurries the antidote to any street-level slush piles you may encounter. Knit in a tube, this scarf is double-cozy with no unsightly wrong side, and our free pattern maps out the colorwork in both chart and written form. Gradations of snow and sky are extra lovely in our hand-dyed Posy and Pocket Posy yarns. 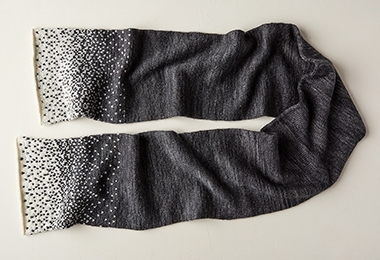 Three of each are together here in our Falling Snow Scarf Bundle, available in nine palettes. Choose spare and wintry (like our Weathervane Gray version), or go for can’t-wait-for-spring with Main Colors like Pink Papaya or Fern Green. Either way, flurries of stitches are always beautiful! Click Product Details, above, for more information. Addi Turbo Rockets are the ultimate circular needles for speedy, snag-free knitting! Click here to see our full range of sizes and lengths, or click Add To Basket to purchase these US 3, 16-inch needles for knitting up a Falling Snow Scarf!